Once upon a time... in the country of Bangladesh (no, it's not only hurricanes, disasters, famines... there are actual people there), in the capital city of Dhaka, if you take a big magnifying glass, and skip through the pollution, the jams, the noises of horns, you'll see thousands of bikes running its streets, like blood in its veins. Well, if you are careful, these are not exactly bikes, more human powered taxi-bikes, or, like Bengali call them, rickshaws. Not exactly thousands, but hundreds of thousands, around six hundred thousands, in a city of fourteen million souls. Hundred thousand bikes means twelve lakh rickshaw wallahs (or twelve hundred thousands pedicab drivers, if you may), but it means thousands of rickshaw garages, thousands of mechanics, thousands of rickshawwallahs dormitories. 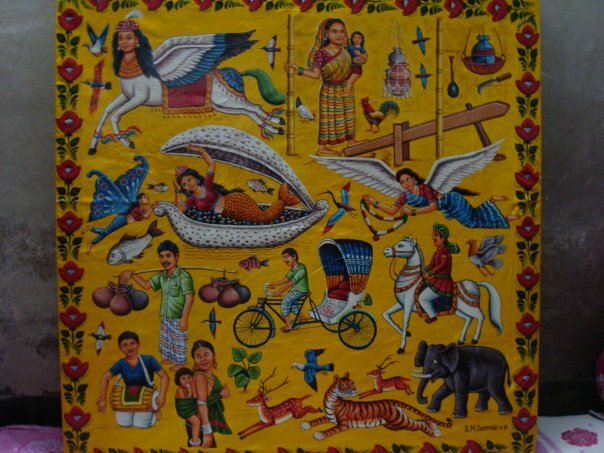 At the maximum zoon of your magnifying lens, you will see the builders, rickshaw painters, the artists thanks to whom the cycling paintings circle the streets. You could see Shafoan, Shamim, or Tipu, hunched over a tin plate, painting each square inch of the rickshaw. And then ... well, the video can explain it better than me. 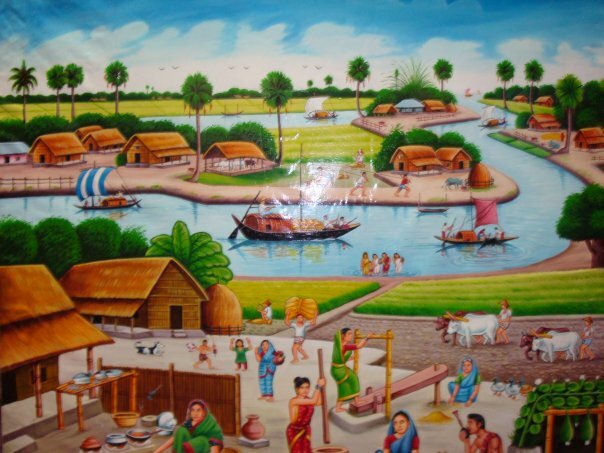 Rickshaw, a traditional eco-friendly non-motorised vehicle in Bangladesh, is difficult to imagine without decorations and paintings done by local self-taught artists. 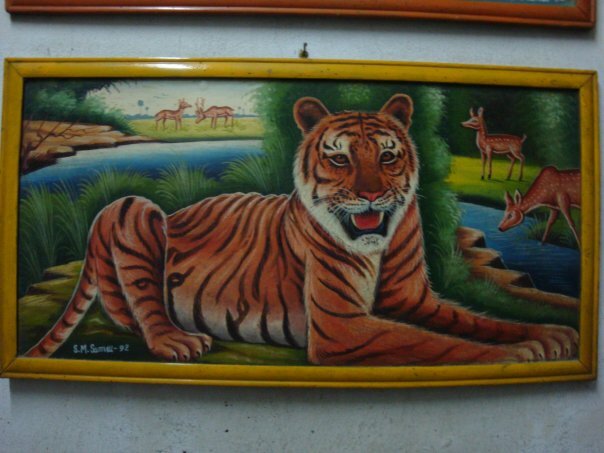 This creative work has now become a sophisticated form of art as ‘Rickshaw painting’. 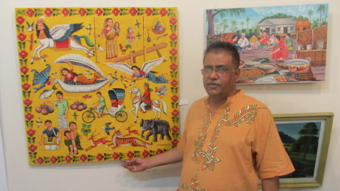 The art-lovers, who are yet to experience the genre, could make plans for today as it marks the closing day of ‘Rickshaw Art Exhibition’, a weeklong group art-show at Zainul Gallery of Faculty of Fine Arts (FFA) on the Dhaka University campus. The show has been arranged as part of ‘Dhaka Rickshaw Fiesta Week 2013’, a joint-collaboration of Japan-Bangladesh governments. Japanese Ambassador in Bangladesh Shiro Sadoshima inaugurated the festival on 13 March as chief guest. The inaugural programme was also attended by Professor Syed Abul Barek Alvi, dean of FFA and Dr Mohammad Iqbal, an assistant professor of FFA. 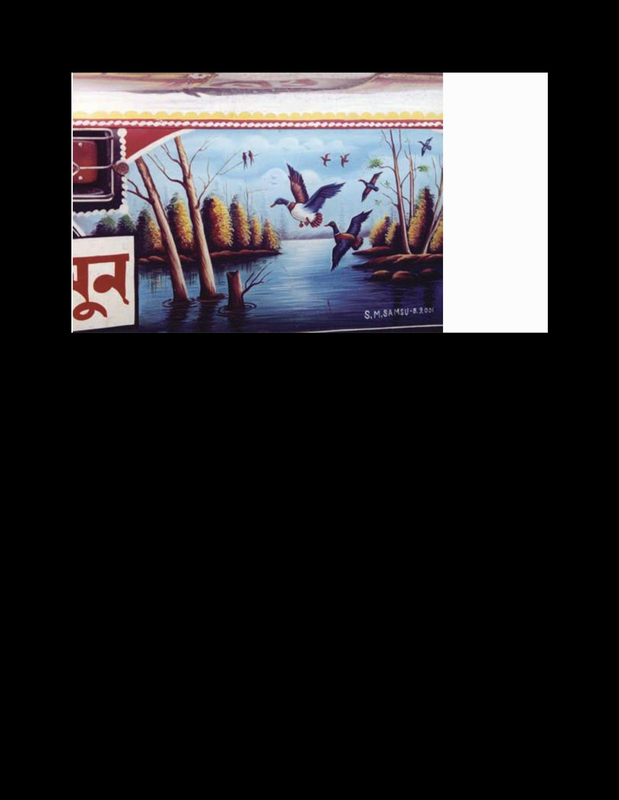 The exhibition features a total of 64 attractive paintings by six professional rickshaw painters including Syed Ahmed Hossain, Dherendra Chandra Das, Rafiqul Islam, Saleh Mohammed and SM Samso. 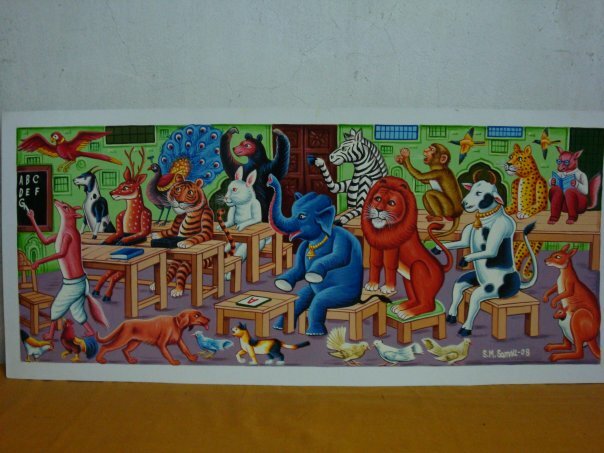 The artworks, figurative and natural scenes, portray different types of animals like lion, tiger, elephant, giraffe and monkey singing and playing instruments. Some images represent a dreamy world of Dhallywood, capturing the action, romantic and dramatic sequences of Bangladeshi films while others take on busy places of Dhaka city including Kamalapur Railway Station, Matijheel Shapla Chattar and Sadarghat Launch Terminal and others. 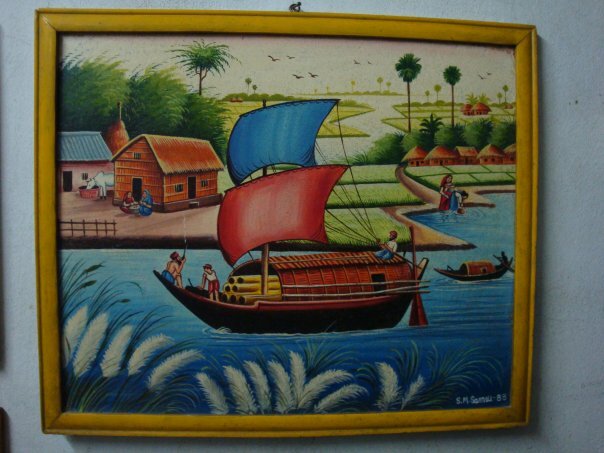 Rural scenes, such as waterfalls, snow-capped mountains, chickens, cows, ducks, palm trees, water lilies and boats sailing across rivers and lakes are also depicted though some paintings. The exhibition is open to all from 11:00am to 8:00pm until 20 March. 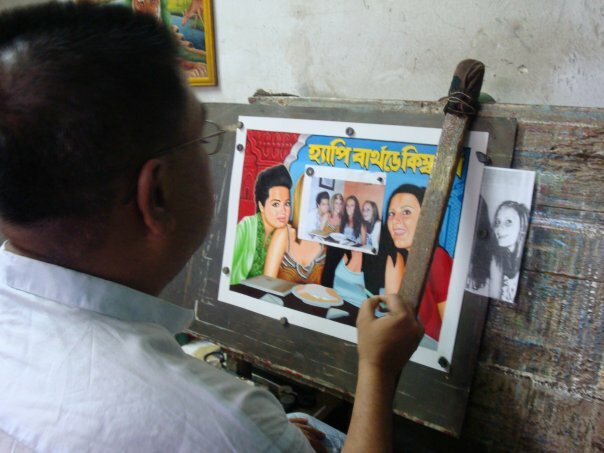 Samsu is one of Dhaka’s most prominent rickshaw painters. 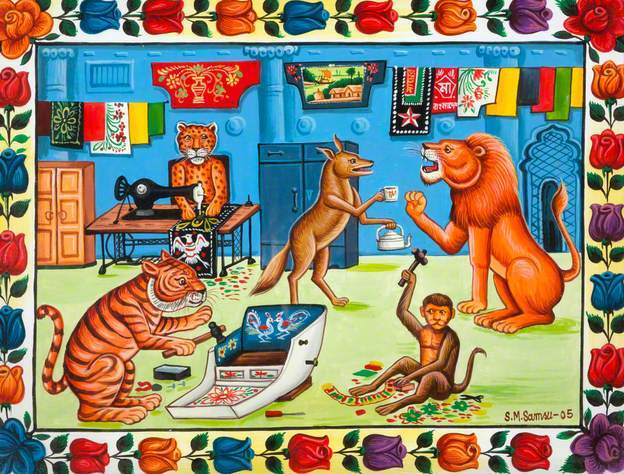 With this one, he has left his usual theme of bengal tiger tea parties or bengal tigers and monkeys as traffic controllers, and has correctly captured a popular aspiration. 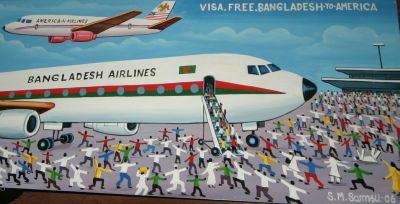 Sadly political and social commentary in art is a rare thing these days in bangladesh. It all began when I was a little boy—a school goer; started drawing on walls. 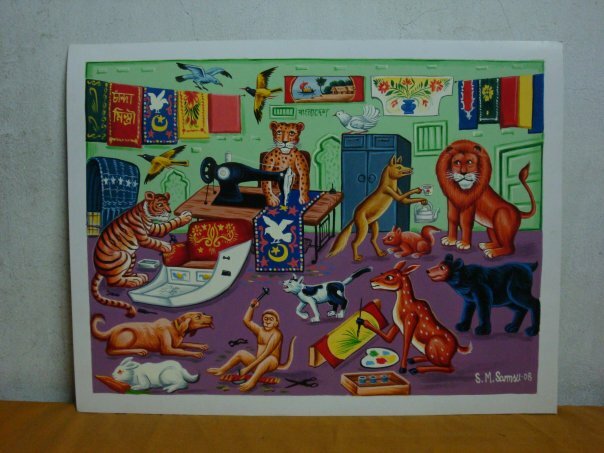 Later on, I found Zainul Abedin, an iconic Bengal painter, in my text book, and was spurred immensely seeing his works and reading about him. My math notebooks became filled up with drawings. But what about colouring? As my parents were poor, I made different colours squeezing various vegetable leaves that quite worked for my paintings. My dad, a devout Muslim, didn’t like paintings. Of my going to school and of my coming thence, I came across rickshaw painter Abdul Haqim’s shop, upon the main street. ‘‘Would you teach me how to draw and paint?’’ I implored him one day. He told me to see him with my guardian. I convinced my parents that I didn’t like studying and wouldn’t go to school anymore; I’d learn to paint. It was 1974. 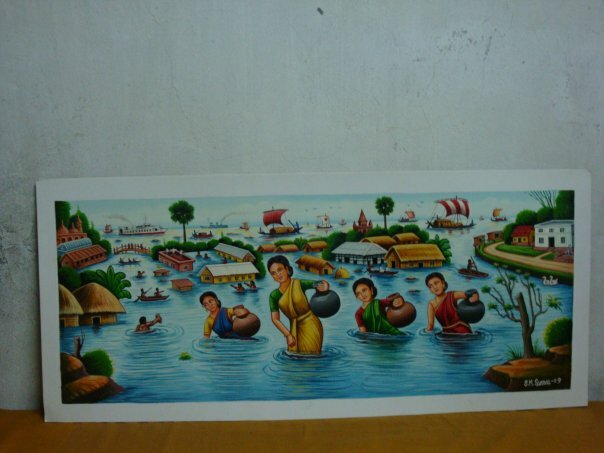 Having taken three years work lesson from him, I wanted to be on my own to get into the profession—rickshaw painting. Initially at home, and then rented a place, to do my painting work. Since digital printing kicked off in 1996, I fell into trouble. 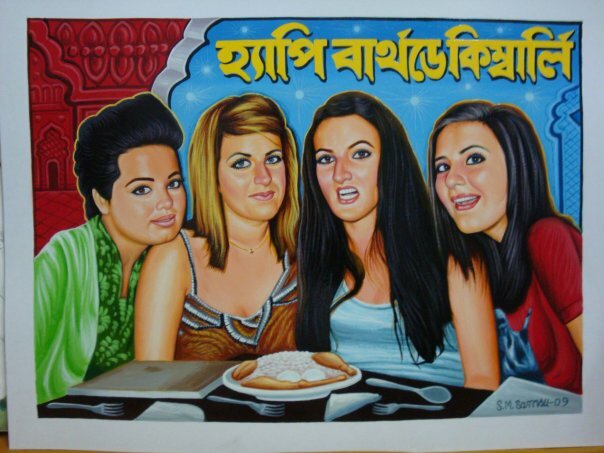 However, over the later years I got numerous painting orders from foreigners. 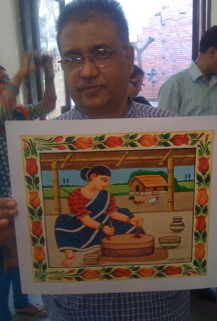 Alliance de Franchise, with works of 85 (including me) rickshaw painters, in 1999, organized an exhibition. In the same year, my painting was awarded in the Rickshaw-Painting-Competition on the occasion and on the theme ‘‘50th Anniversary of the Federal Republic of Germany’’.